Just like humans, dogs require sleep. 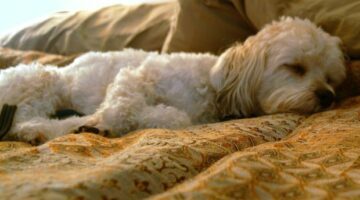 Here you'll find our best tips for ensuring that your dog is getting the best night sleep he can. We're also reviewing dog beds, pillows, and other products to enhance your dogs' sleep. Check out these cool facts about dogs and their dreams as well. It’s amazing how many dog & people similarities really do exist. That’s right, for many of the things that we do as humans, there’s an equivalent behavior in the dog world. Here are lots of interesting similarities between dogs and people. As as a dog’s Senior years go by and the Geriatric years approach, we dog owners need to add a few more things to the list of what to watch for and do, in order to help our aging dogs get as much out of life as possible. Here are some Senior dog health issues to look for, plus some tips for providing daily care for older dogs. Just who did we buy those expensive pillows for anyway?… We recently invested in a new set of down pillows for our master bedroom. They were very expensive. Aside from the fact that we allow our dog on our bed — though we didn’t used to — we’re now finding that he uses our new pillows all the time! Four rules for dog owners who let — or are considering letting — their dog sleep in the bed with them. Does Your Dog Have A Pillow? 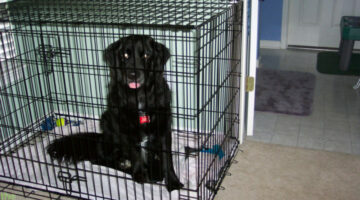 Dog Crate Mishaps… It Wasn’t As Easy As We Thought!